As an entrepreneur, do you have plenty of receipts that need to be organised? Or do you often travel and monitoring your sales and receipts has come to the point that it annoys you? What can be the right mobile apps that handle this function? Not with the new mobile gadget technology and apps that can assist you to get your expense reports completed quickly and record your tax-deductible costs. It can handle your insurance files, and organise your receipts well. And you are traveling, there are mobile applications that can help you monitor your expenses and remain topnotch of your finances. There are mobile expense tracking apps that helps you manually record your incoming and outgoing transactions. 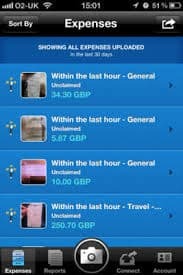 There are other mobile apps that have receipt scanners that automatically retrieve receipts data. Other apps can match your expense records with your credit cards and other bank records. Another feature of apps is its ability to transmit expense reports, save your expense records to another format like PDF, QuickBooks, or Excel. Other apps synchronises with cloud systems such as Dropbox. Simple mobile apps are usually free but with more complex and customised apps, there is usually a one-time fee from apps stores or mobile apps developers. With this kind of mobile apps synch with your mobile gadget, you can organise receipts and monitor your finances and make expense reports easily! For your mobile apps needs, press here to discuss the right applications for your business. Types of Smartphones: Which One is for You?